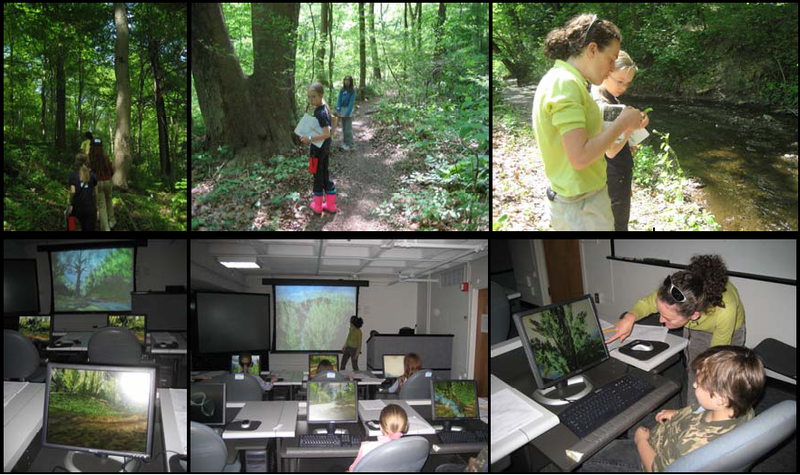 The Virtual Trillium Trail research project (2003-2008) aims were to build a realistic educational simulation of elementary school environmental science curriculum as imbedded in activities of real world field trips. It was an investigation into the design, construction, testing, and evaluation of the human-computer-environment interface and the virtual model of nature. The research focused on the ethnographic design and empirical results of the design parameters that affect learning activity, knowledge acquisition, creativity, and emotional outcomes. The project collaborated with Gabi Hughes, Environmental Educator,Audubon Society of Western Pennsylvania, who coordinates the Fox Chapel Area School District environmental science education program. Teachers, especially Beth Durbin, from the Fox Chapel Area School District, were instrumental and supportive. Volunteer third, fourth, and fifth grade students from the greater Pittsburgh area participated in the IRB approved research. In addition, Professor Susan Kalisz, Department of Biological Sciences, at the University of Pittsburgh, and senior research associate Jessica Dunn, collaborated and provided the plant population data sets fo the real field trip location, the real Trillium Trail, required to build the visualization of the park. The Virtual Trillium Trail is a unique data simulation and visualization of Dr. Kalisz’s long-term NSF biological plot study data, unlike any other virtual world for education and a model of Virtual Nature. Furthermore, the location of the Trillium Trail Wildflower Reserve is the site for many science school field trips, created and lead by the Audubon Society of Western Pennsylvania. The combination of the biological data and the proven educational approaches (from 1968, Beulah Frey, Ruth Scott and Ruth Boyles) offered an ideal and successful real world learning experience to model, on which to base a computer simulation for research into the usability of virtual worlds, and to better understand patterns of intrinsic learning found in informal settings. Figure 1: Images shows the real and virtual field trips. Top images of activity in the real Trillium Trail, and bottom images of the software deployed in a computer lab at the University of Pittsburgh with The Virtual Trillium Trail, 2007. Figure 2. The data for Knowledge Gained in one hour of independent play. Figure 3. The data for Salient Events in one hour of independent play. 1. Technical and Research Design Matters: Technical contribution of the Virtual Trillium Trail as model of Virtual Nature is based in the careful design and execution, with attention to information quality and visual accuracy. This allowed one system to be modified to isolate the cause and the effect of the variables. As a planned orthogonal contrast, the statistical framework increased the power of the research design and results. Such platforms include high fidelity, photorealistic 3D plant and flower models, large open spaces representative of the environment, visualized in interactive, multi-modal, game engines. The main empirical contribution this POC design was to support the isolation of the influence different levels of the factors of Visual Fidelity and Navigational Freedom have on the output variables: Knowledge Gained (i.e., the difference between pre and posttests), and Salient Events (i.e., count the number of times there is a change in learning behavior from exploration-mode to inquiry-mode). 2. Reality Matters: Comparison of Real and Virtual Learning Environments: Ethnographic and empirical evidence prove the transfer of knowledge from Real to Virtual and Virtual to Real, thus demonstrating how to use virtual environments for priming, transfer, and reinforcement for maximum learning gain. These conclusions indicate the Virtual-Real-Virtual order is the best practice. The Real Environment is superior to the Virtual Environment for learning activity, but when the content in the Virtual is identical, using a subset of identical plants and flowers, to the Real, learning activity outcomes are the same. The Real was found to be superior, but for plant-only data, Real and Virtual were identical. 3. Gender Differences in Information Seeking and Learning Behavior of Young Children in Virtual Learning Environments: Elementary aged boys and girls in the study showed differences in wayfinding navigational choices and exploration, and in deep inquiry with information-seeking behavior. Each requires 20 minutes in the virtual model before switching to the opposite gender linked styles. Upon deeper examination of its implications, for both software design choices and teaching methods, the conclusion is that girls benefit from High Visual Fidelity, but they are penalized by Low Visual Fidelity interfaces. 4. Visual Fidelity and Navigational Freedom and as Design Factors: There is significant interaction, ( F(1,60) = 4.85, p = 0.0315), between Visual Fidelity and Navigational Freedom, as design factors in virtual models used as educational simulations, thus proving that both of these factors must be present to have the greatest impact on changes in test scores, as measured in Knowledge Gained. Visual Fidelity is strong and significant (F(1,60) = 10.54, p = 0.0019) as a factor, and Navigational Freedom shows a strong trend, (F(1.60) = 2.71, p = 0.105). 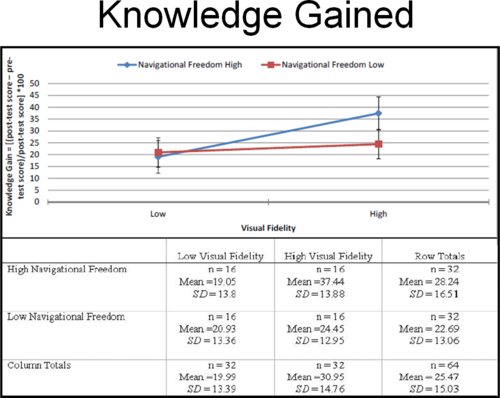 The combined conditions of both High Visual Fidelity and High Navigational Freedom result in superior Knowledge Gained on tests, (cell mean = 37.44 % increase in test scores, SD = 13.88) when compared to the Low Visual Fidelity x Low Navigational Freedom conditions (cell mean = 20.93 % increase in test scores, SD = 13.36), and an unpaired t-test (t = 3.4280, p = 0.0018) is significant. There is no interaction, (F(1,60) = 1.48, p = 0.2285), between Visual Fidelity and Navigational Freedom, as design factors in the virtual model, thus proving independence of these two factors on Salient Events. Salient Events measure the number of times student behavior changes from exploration to deep inquiry. Visual Fidelity is strong and significant, (F(1,60) = 4.35, p = 0.00413), proving to be a critical design factor for increased learning activity in virtual reality or games used as educational simulations. It alone, is responsible for significantly increasing learning activity. Navigational Freedom, as a factor, shows a strong trend, (F(1,60) = 3.23, p = 0.0773. The data show that the High Visual Fidelity condition (Row Mean = 14.46, SD = 6) resulted in more Salient Event counts than did the Low Visual Fidelity condition (Row Mean=11.31, SD = 6.37). The closer the virtual model matches the real environment, the more times a child’s behavior will change from exploration to inquiry. Thus, Visual Fidelity increases a child’s independent desire to learn, to explore and inquire, and to ultimately understand the world, based on information they independently find salient. A design choice, High Visual Fidelity, has the strongest impact on this change of information-seeking behavior, indicative of a desire to learn, curiosity. Visual Fidelity is a powerful, significant, and independent factor affecting Salient Events. 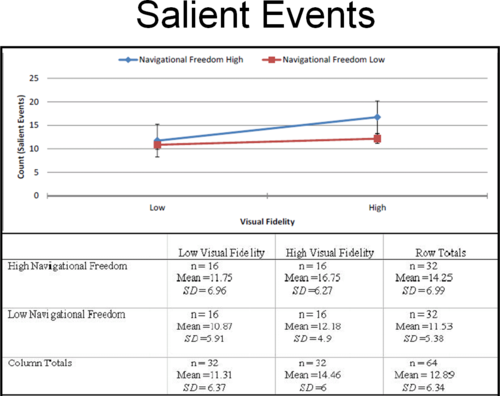 Additionally, Salient Events are significantly higher in the High Visual Fidelity x High Navigational Freedom conditions (cell mean =16.75 plant fact cards selected/ 1 hour, SD = 6.27) when compared to the Low Visual Fidelity x Low Navigational Freedom conditions (cell mean = 10.87 plant fact cards selected/ 1 hour, SD = 5.91). In an unpaired t-test (t = 2.7297, p = 0.0105), the results appear strong and significant. High Visual Fidelity and High Navigational Freedom conditions increase Salient Events, and are thus critical design features for virtual models used as educational simulations, especially since Salient Events are moderately positively correlated with Knowledge Gained (rho = 0.455, p = 0.000) in the SEEE Model. These findings have significant implications for both cartoon-only educational applications (e.g. Low Visual Fidelity) and film with a linear navigation (e.g. Low Navigational Freedom), as both forms of media are inferior to a high information accuracy, photorealistic, and open, 360 degrees of freedom for individual exploration, as designed in digital media artifacts, such as virtual nature models. 5. Simulated Ecological Environments for Education (SEEE) Model: Represents a theory based on empirical models to understand the causal models of information flows, and to gauge the effect of the design factors in the complex user interfaces in virtual nature on human thought and action. Future research, in the form of regression equations and Markov models, toinvestigate the complexity and causality of such interactions between the human, the virtual environment, and the user interface. A few videos of The Virtual Trillium Trail, 2009.